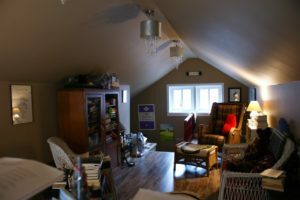 I am fortunate to have a writing room – a Virginia Woolf room of my own – three floors up in the attic of our old arts and crafts home. The houses on our street are very close together, so although I have the luxury of windows that open on opposite sides of the room, there is not much of a view, save that of the attic windows and roofs of our neighbours. But this is in my favour, as it provides much less of a distraction then say, a sunset over the ocean, or a meadow dotted with deer gambolling about. If indeed that were the case, I might not write one word and instead, merely spend my hours thinking how poetic these visions are. Although I have an iPod connected to a speaker, I rarely turn it on. I need my quietude to write. I sometimes wish I was one of the people that could sit in a café and write amid the voices and activity, but I’m not. I need to concentrate and focus. I need to be in my familiar surroundings. I can’t sit at the kitchen counter and work or take my laptop outside, as I get nothing written thanks to my easily distracted mind. I love my writing room. I waited a very long time to have it, and then once I had it, to be able to finally fully use it and be in it. I have a few or many totems that speak to me. 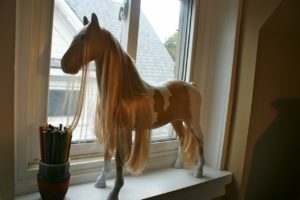 Most recently, I received my poetry palomino, affectionately name Pamela, on my 60th birthday from my dearest writing friend. Her gentle face, so much more than plastic has her eye on the rocking horse in the window across the way. She is a presence – a reminder of the encouragement I am privileged to have when I doubt my ability. And what’s a writing room without a cat? Kizzy is attentive to all my recitals except when she naps, which is always. If she is undisturbed by my voice when I read to her, I know then that what I have written is good enough.